Service. One of the things I'm asked the most is "what do we wear?" 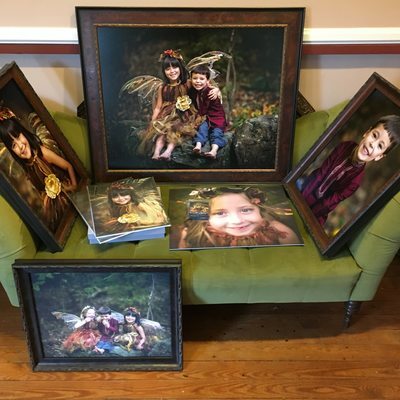 I provide the wardrobe for Fairyography photo session, and I will also help you pick out wardrobe for family sessions.. even to the point of picking out everything and sending you links to buy. This service extends into everything else I do. 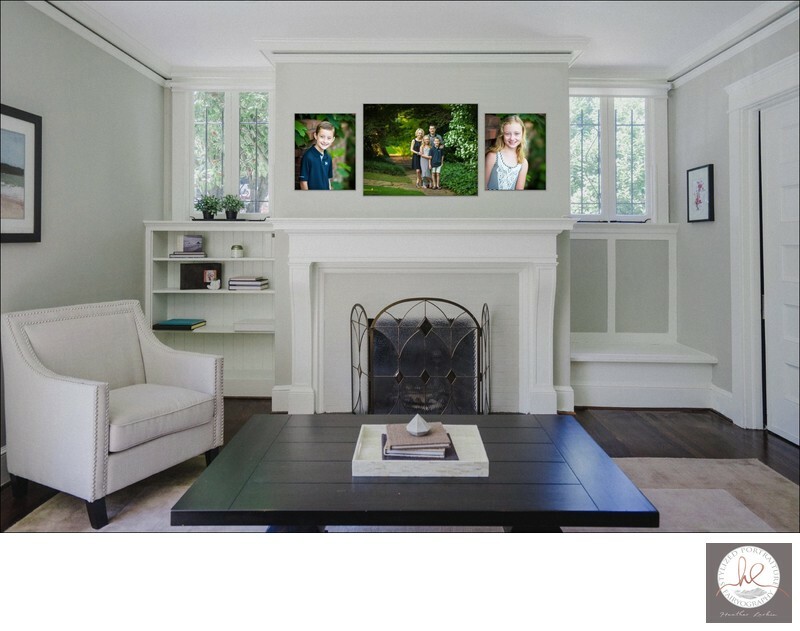 I answer emails and calls quickly, you can have an outdoor or in-0studio session, and you'll come in to view your images and get my help and suggestions for what you should be hanging in your home. Experience. I've been in business for 15 years. Not only do you get 15 years of my being a photographer, but you also get all of my years of being a preschool teacher before that. I know how to talk to children and make the photos a fun experience for everyone in the family. One of the things a lot of my clients tell me is that I have so much patience and they're very thankful for the great time they had. Prints : All prints are backed with styrene. Styrene is a super smooth plastic mounting surface that doesn’t warp, making it perfect for the southern humidity. There are two different types of papers, Lustre and Deep Matte. Lustre has a light sheen and a sharper image. Deep Matte has a non-reflective surface that feels velvety soft. Framed in your choice of frames, prints arrive assembled and ready to hang. 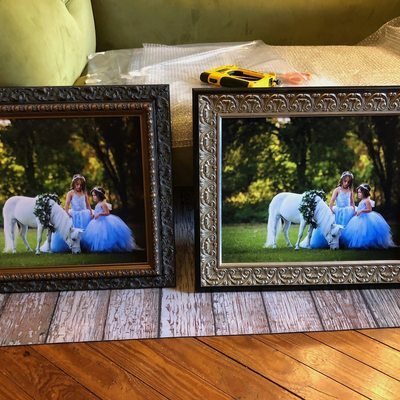 Canvas: My Canvas Wraps aren’t stretched around a hollow frame. They’re professionally mounted to a solid wood structure, which means they are guaranteed to never sag or warp. They’re also able to withstand little hands and rough handling. Albums: They combine custom craftsmanship and handmade details with fashion-forward looks. Luxurious leathers and distinctive fabrics compliment your cover image and you choose from the acrylic crystal cover or the photo indent. Hand paintings: These portraits are hand-painted, stroke-by-stroke, using a tablet and stylus and utilizing the premier painting software, Corel Painter as well as acrylic embellishments. Traditional style and technique combined with today's technology. Ask about cards, jewelry, or other products you'd like. You're a busy mom. Your mother or your mother-in-law have been bugging you about photos forever, but there's just no time! Between dance lesson or soccer practice or that thing that needed to be done for school last week, it's just exhausting. Maybe the water heater quit or your tires need to be replaced and you'll get to it when you can afford it. Photography just feels like the last thing you need to worry about. There’s always tomorrow, next week, next month, or next season... right? Except.. the kids aren't getting any smaller. They don't stop growing just because you don't have time to get photos made. It'll be next month.. or next year, or a few years later and suddenly you'll remember that you missed portraits when they were five years old and you can't get that back. You know you need photography, but how do you find the best photographer for your family? You worry that your kids will be too shy or too crazy and you're scared you won't get any good photos. You want a photographer that has lots of experience in tough situations and can still make amazing photos for you. Stylized Portraiture is exactly what you're looking for. As a photographer, I've been creating portraits for families and babies and kids for 14 years, and I was a pre-school teacher before that. I know children, and I know how to bring a shy child out of her bubble or keep a crazypants kid from running all over you (and me!). Your photo session will be a relaxed, fun stroll through the location of your choice. I will seat you in a specific place, but never tell your child to 'smile'.. instead asking them about their favorite things at school or making up silly songs. I tell you, fart jokes go a long way to distracting kids from taking pictures.. and it works on grumpy dads too! I have all the patience in the world when it comes to taking our time to have a nice enjoyable photo session. I often get emails later on telling me that the kids are still asking when the next time they'll see me again will be. And you don't have to take my word for it, you can read the testimonials page for words from moms like you. After the shoot, I go through your photos and edit the best. You'll come in to view them with me so you're not slogging through an only gallery alone at home with no help. You'll see and touch all the products that I have to offer, so you'll know exactly what you'll get. 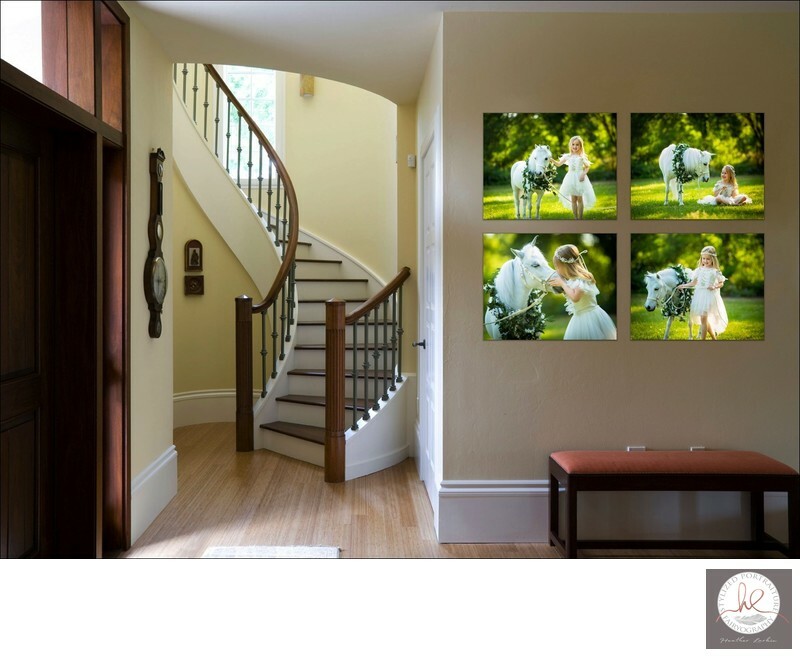 Your images will look exactly like you'll receive them in your albums or wall prints. If you order frames and prints, they'll be in those frames and ready to hang when you get therm. Everything to cut down on your time and effort spent on this and make it as easy as possible for you. Your baby girl is growing up too fast. It's hard to believe that one day she'll worry more about boys and makeup than she'll care about princesses or fairies. It's such a short time when she still believes in real magic. How long will she keep that innocence? You want to cherish this time, but how? Let her be a fairy for a day! As a photographer, I've been creating portraits for little girls for 14 years, and I was a pre-school teacher before that. I know children, and I know how to bring a shy child out of her bubble or keep a crazypants kid from running all over you (and me!). Her photo session will be magical, a fun stroll through the location of your choice. But before that, she'll be pampered at my partner salon for hair styling and light makeup if she's old enough (girls under 5 are too wiggly for the curling iron). Then she'll get dressed in the gown and wings. The wings just slip down the back of the dress, no uncomfortable straps needed! The shoot is relaxed, we take our time to enjoy the flowers and birds. I often get emails later on telling me that the girls are still asking when the next time they'll see me again will be. And you don't have to take my word for it, you can read the testimonials page for words from moms like you. After the shoot, I go through your photos and edit the best. You'll come in to view them with me so you can see her whole story without distractions. You'll see and touch all the products that I have to offer, so you'll know exactly what you'll get. 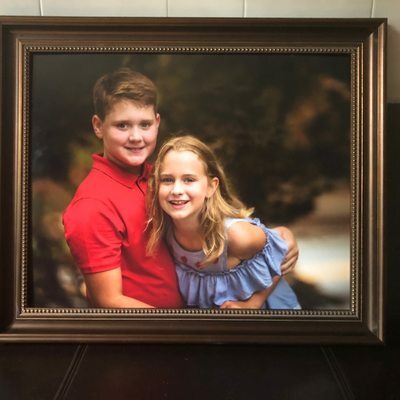 Your images will look exactly like you'll receive them in your albums or wall prints. If you order frames and prints, they'll be in those frames and ready to hang when you get therm. You have worked so hard. It's time to show off what you can do! You need images to use in auditions, your own instagram, on your teaching website or the school walls. Family and Fairyography sessions do not include digital or print products. You will have the opportunity to purchase digital and prints or albums at your ordering appointment. 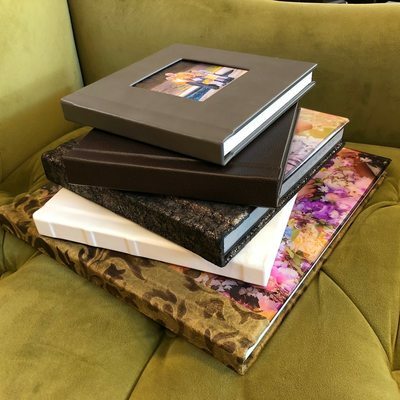 See the samples of the prints and see why my photo albums are so coveted! Your final products are the other half of what make a Stylized Portraiture session so unique. and I want you to see what could be hanging on your walls or sitting on your coffee table. Watch the videos below to see all the beautiful products you could have in your home! Make your Fairyography 'once upon a time' last forever, cherish your family memories for generations to come, and keep that chubby baby face around for just a little longer. 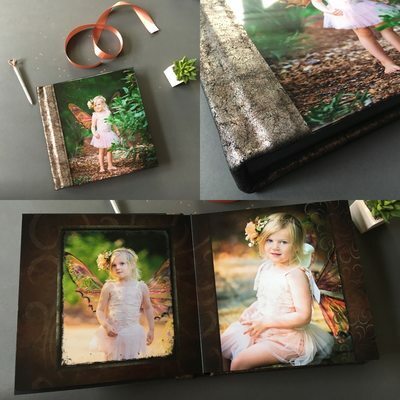 Albums: Choose from several elegant leather or fabric styles and watch your fairy or family session come to life! Tell your story over and over again with 20 or more pages of stunning photography. The cover and rounded edges are remarkably beautiful, and thick matte board pages will hold the test of time (and little fingers). And album is the perfect way to have a full story of your session without having a shrine on your wall. 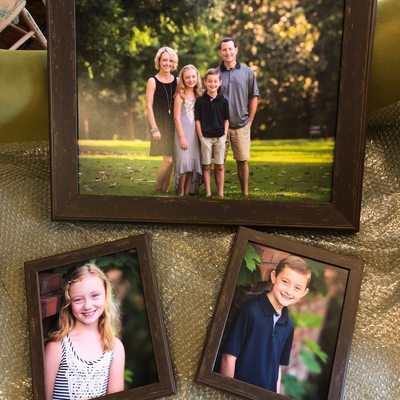 These will become a favorite family heirloom in no time! Prints: We are pleased to offer you professional quality photo prints. Choose your favorite images and have them printed to the highest standards. 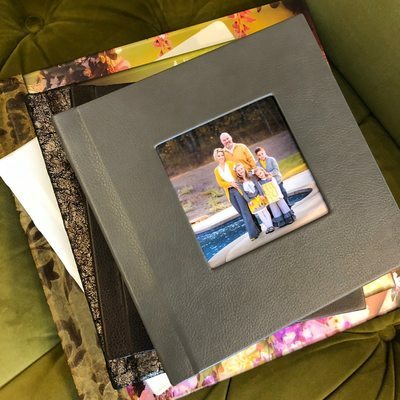 Your photos will arrive printed on archival quality paper in your choice of lustre, metallic, or deep matte. Lustre is a middle-range paper with a slight sheen. Metalllic paper is glossy with a semi 3D effect the really make the images come alive. Deep matte is a paper with a satin laminate that means the print has no shine at all, perfect for places with a lot of reflection. Prints will come backed with styrene for durability. You may also have them printed without backing if you would prefer. Frames: Framing a print is just as important as the print itself. Not only does it set your image away from the wall, but it finishes the piece in itself. Frame a bigger image with a more substantial frame, but don't drown a smaller image in a frame that's too thick for it. 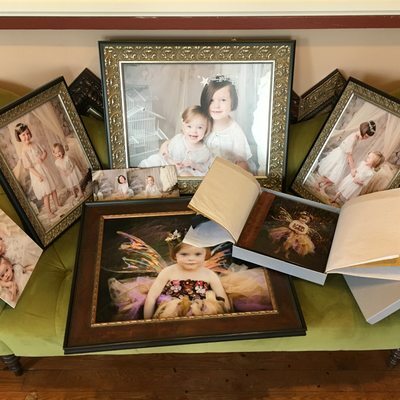 We offer upscale frames for a more magical feel as well as more simple ones for your modern family portraits. Digital Images: Digital images make it easy for you to archive your whole session. Your session will arrive inside a charming metal USB drive shaped like a key! Who knew a tiny little key could unlock such magical moments? Hand Painted Canvases: There is something so beautiful about the stroke of a painter's brush. Perhaps it's because the art of painting has been around for thousands of years. Or maybe it's because paintings have a way of diving into our souls and capturing just the right amount of emotion. 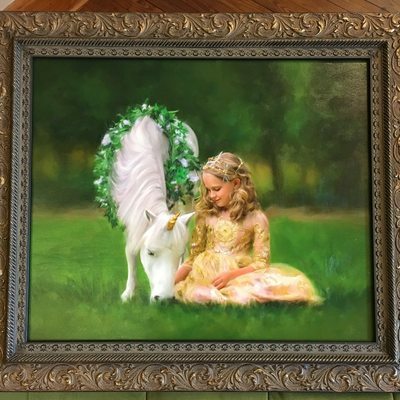 Fairyography and Stylized Portraiture are now very pleased to offer these hand painted portraits of your favorite images mounted on high quality canvases. The soft brush strokes in every image evoke a fairy tale dream that is long-lasting and of timeless quality. Be sure to ask about these beautiful hand painted portraits during your ordering appointment! You will be glad you did. 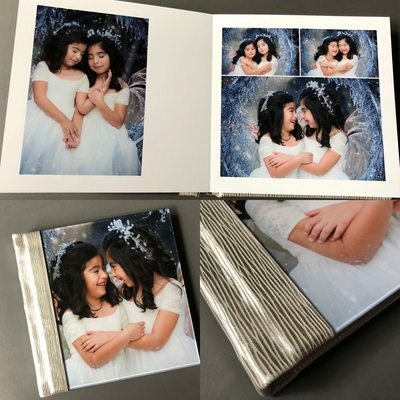 Accordion Mini's: Beautifully crafted with a soft velvet cover, these adorable mini photo books are the perfect addition to your session! 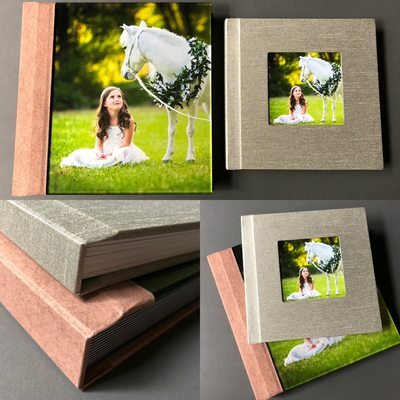 Choose 12 of your favorite images and have them displayed in this pocket sized album that is sure to be a delight for family and friends. Wondering who to gift them to? The Accordion Minis come in a set of three identical books. Often times, the proud parents will keep one for themselves and give the others to each set of grandparents!